It is not just jealousy that doth mock the meat it feeds on; hatreds will do just as nicely, ensuring that the Johnnies and the Mehmets shall part ways, man barricades and fill the coffins. This is disappointingly casually inflammatory. IMHO. Perhaps more should have been said in regards to the ever increasing partisan political & commercial hijack by the coalition of ANZAC ceremonies, for decades. NOT in solemn remembrance of the fallen, but in rabid politically motivated jingoistic nationalism & commercialisation for profit.. Destroyed Afghanistan, the 20 year war continues. Destroyed Iraq, the 16 year war & occupation continues. Destroyed Libya, now yet another failed State, and continues to be so. Destroyed Syria, and the partial occupation continues. One could go on, but there is a common obvious thread … they were all muslim nations, at the mercy of the freedom & Democracy loving West. Just as our Australian home grown terrorist was formed in our nationalistic islamaphobic permissive society since 2001, so has the views of the wests victims. We should be trying to look through the eyes of those in Turkey & other islamic nations, and try to see what they have seen, again & again for the last two decades. Even back to post WWI when the UK & France literally arbitrarily drew lines on a map to carve up and out new nations in the middle east and created or installed new ‘Rulers’, ‘Kings’ & ‘Dictactors, all suborned, imposed by rightof might of arms, so 44 gallon drums of oil could be exported for a penny a barrel. There has been much to be aggrieved about by the suppressed & exploited for 100 years now in the Middle East, by their imposed ruling elites, for the commercial and geo-strategic benefit of the West. A mild, in context, reaction to yet another massacre of defenceless innocent muslims, on top of all the above should be understandable. Indonesia called in the Australian Ambassador for a rebuke, how was that missed. Murdochs Limited News, Sky News & & our Coporate MSM (except the ABC) deliberately ran footage of the livestream massacre, despite appeals from Sky NZ, even the NZ police. Demagogues ? Perhaps we should look to our own sins, the wooden beam in our eye, before pointing out the splinter in the eye & hurling rather large bolders at others ? Uhm ….. the ANZACS withdrew form Gallipoli without loss for diverse reasons including orders from the Turkish High Command to let them depart peacefully. The ANZAC tradition has many other reasons. Ataturk pushed the ANZACS down from Lone Pine with his first attack in 1915 because the British High Command were “taking tea” on the beachhead, with troops lined up in inspection order, being picked off by Turkish snipers. No British re-inforcements meant that the freshly imported Turkish troops, having superior numbers took out the position that dominated ANZAC Cove and the Turks made effective military use of that position, at great mortal cost the ANZACS. When an objective history or biography of Winston Churchill (WC) is published in the future, doubtless the failure of his unthinking military strategies will be evident for all to see. Yes, WC inspired Britain in 1939-40 to resist the German Nazi war machine, Yes, WC was among the first upper class (Parliamentary) British opponents against Nazi imperialism. Yes, this “soft underbelly” strategy was a failure in both World Wars, in Gallipoli, and later in WWII in Italy where it actually extended German Nazi resistance by 9-12 months. I commend the Waleed Aly article to you all. It is very sensitive broadcasting from a thinking Australian. AIMN, would it be possible to replace one of the 8 links below with this Waleed Aly piece in place of 1/3 links to Toxic RAbbott say? And dear old Winston Churchill planned and executed sustained chemical attacks by air & artillery on northern Russia in 1919 against those Russian Bolsheviks, Post WWI. Ordered the indiscriminate RAF strafing & bombing of essentially defenceless civilians in Iraq (British mandate) & Afghanistan tribal regions, as well as the egregious deployment (disputed) of chemical weapons, post WWI … to create object lessons … all in service of ‘Civilisation’ & Empire. An active champion & advocate for the use of chemical weapons, of which the Brits were & still are experts, all his life. It is interesting reading. And what it says used to be in 1980 what was actually written at the Canberra War Memorial, but those words now reflect the current mythology. When Abbott came to power Brendon Nelson, former deposed Lib opposition leader, was appointed director of the Australian War Memorial (AWM) in late December 2012. At the expense and insistence of Abbots incoming government, the appointment of a former journalist by the outgoing government was withdrawn. He has, IMHO, presided over the promotion of said myths, the diminishment of factual historical record and context (former AWM researchers concur) in pursuit of ‘glitsy’ displays of superficial jingoistic nationalism. Not solemn remembrance. Not an anti-war message. The exact opposite. Since December 2016, the ­Inspector-General of Defence has been conducting an in depth & wide ranging investigation into claims that members of the ­Special Air Services Regiment and Commandos may have ­breached the laws of armed conflict, war crimes, during the war in Afghanistan. A secret, in camera investigation also involving the AFP. The last major vacancy, that of deputy director, has been filled with the potentially controversial appointment of Tim Sullivan, now the deputy chief executive of the Sovereign Hill ”open air museum” in Victoria, due to be announced soon. Director of the Australian War Memorial, Dr Brendan Nelson. Recruiting from a historical theme park has set alarm bells ringing in some quarters. A Vietnam veteran told Fairfax Media the AWM was ”already in danger of going down the historical theme park road” with the decision to project images of warfare on its walls before the dawn service this Anzac Day. Now we know what it is like to be on the receiving end of dog whistle politics; what it is like to be a Muslim in Australia. Erdogan is a would-be tyrant in the making, seeking to consolidate as much power as he can by cracking down on the press, social media and any other possible sources of dissent but is facing an election in ten days. 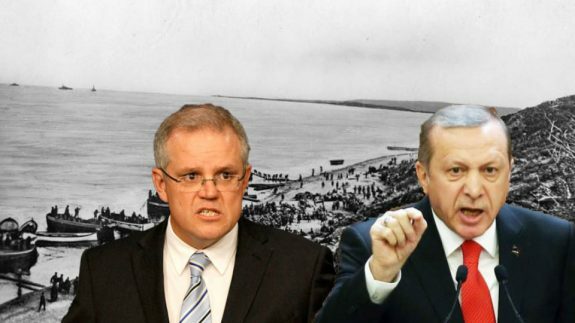 That speech was intended for Turkish domestic consumption to make himself appear bold and strong in the face of vague threats from supposed external enemies – no different from what Morrison or any other politician has been doing locally. Perhaps we should consider such things before we crank the Outrage Machine up to eleven and give the extremists yet more to campaign about. Which “extremists” do you mean, Zathras? Trump or Dutton? Hanson or Anning? or just Tarrant and his nuttish, armed to the teeth confrateres here and places like Europe and the USA? Yes, Erdogan’s speech was dog whistling. Given that it was OUR terrorist this time, we probably ARE uneasy about retaliation. Personally, I would be avoiding Morrison’s dog whistle photo-op at Gallipoli, because I now feel the same unease about irrational violence as do Muslim minorities in places like Australia. Is it possible that the Christchurch shooter, along with others of the AltRight, believes Gallipoli was a battle against Islam? I see the ‘ I’m not very smart but can lift heavy weights ‘ darling of the rancid right wing anti Muslim nut brigade Blair Cottrell, has been banned from Facebook and Twitter. About bloody time. Well we’ll still have the very real Fraser Anning, even post election, along with his coterie of empowered & emboldened stormtroopers. Hanson has another three years yet & Latham is a certainty in NSW. I am not joking when I say these AltRight bogans are clearly Steroid abusers, muscle hypertrophy localised to the chest area because they can’t be bothered doing exercise other than weightlifing. Then you get Steroid psychosis.